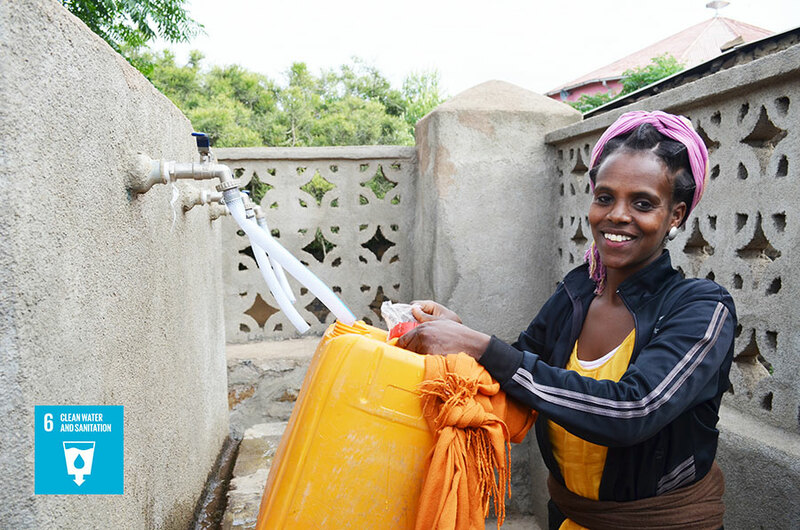 In Eritrea, arid and semi-arid conditions and persistent drought present challenges in providing appropriate and sustainable water, sanitation and hygiene (WASH) services. This is particularly true for vulnerable communities and groups, such as female-headed households. UN Volunteer Bipin Jha (Nepal) is a WASH Officer with UNICEF working on Sustainable Development Goal (SDG) 6: Clean Water and Sanitation. He shares how he contributes through his assignment to enhancing the lives of children and women in the country. In Eritrea, a lady fetches water in Debub region. For a sustainable development approach, it is necessary that the community take ownership and understand the benefit for its members. So, for better sanitation and hygiene practices, we adopt the community-led total sanitation approach. Accordingly, community leaders raise awareness of members of the importance of remaining free of open defecation and adopting better hygiene practices. To achieve their goal, a village in Anseba used some locally-adopted rules to accelerate making their village free of open defecation. This included instating a penalty of 100 Nakfa (equivalent to US $7) for violations, and obligating the perpetrator to remove and dispose of faeces away from the village. This has had a positive impact on community health, with people now reporting a significant decrease in the diarrhoeal diseases. Through the triggering and advocacy, communities were empowered to investment in latrines at their own cost. Villages also appointed hygiene promoters, who were responsible for 20 households each. This provided a structure for mutual community reinforcement and motivation for the greater good. In building the latrines, the community members shared the labour and did the physical work together, particularly in support of poorer families who were unable to manage on their own. UNICEF supported the water resources department in implementing water supply systems in the villages, where they dug wells to tap underground water sources. For the sustainability of the water supply systems, they are handed over to the WASH committee for operation and functionality management. Other challenges to the smooth operation of the system were the unavailability of a skilled technician, lack of availability of spare parts locally and high cost of fuel for fuel-powered generators. UNICEF Eritrea has started to adopt solar-powered systems as a more energy-saving and environment-friendly approach. The organization is also in discussion with government partners to ease access to spare parts hub at Zoba (regional) and sub-Zoba level. People in the community expressed their gratitude for the improvement in their health and sanitation, as they can get safe water at their village after they used to travel at least three kilometres to get unsafe water.